I don’t know about you… But, Sunday dinners definitely bring back a lot of warm childhood memories for me. Sunday dinners have become a tradition for my family. I like to set the table “extra nice” and plan an “extra special” menu to go with it. My kids love it and so does my husband. Combine mustard and garlic in a small bowl. Rub mustard mixture to cover all sides of the pork tenderloin. In a separate bowl, combine the Corsican Herb Blend, salt and black pepper. Cover tops and sides of pork with the herb mixture. Roast for 45 minutes (or until center of pork registers 160 degrees). When done, place on a carving board and cover with foil to allow the meat to rest. Add the chicken stock to the roasting pan. On the range, over medium heat, simmer the stock for 3-4 minutes. Serve with Pork. Reduce heat. Cover and simmer for 45 minutes or until liquid is absorbed. Remove from heat and allow to stand for 5-10 minutes. Corsican Herb Blend is a unique blend of herbs commonly called for in Corsican recipes. You can substitute your favorite dried herb blend. Dried Thyme is especially good with this. 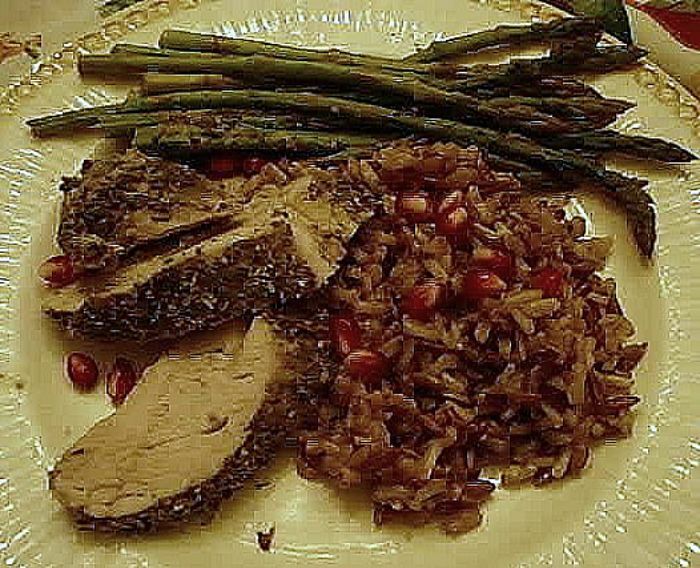 I decided to garnish the dish with pomegranate seeds just for fun. One taster commented that “The rice dish is amazing. I really like it”. My youngest taster has now decided that Pork is his favorite meat. We’ll see how long that lasts….